I'm glad I took my camera to work the other day. I walked in and saw LaMonica's latest color and had to take some photos of her. My girl is always rocking a vibrant color but this color is so off the HOOK! I love it!!!! She is still my Sisterlock Idol. Very chic. You all have this coloring down to a science. JUST BEAUTIFUL!!! You have got to let me in on what color this is. That color is what I have always wanted but afraid to get. LaMonica said the darker color is Cherrywood by Tones and Textures. She also used the lightest color but doesn't know the exact name. I love it also! I agree with Tanya you guys are not the leat bit scurred about the color and it looks great. 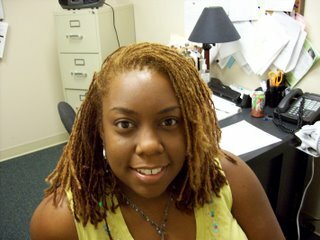 Tell Lamonica that I am definitely a fan of her locks! What color(s) does she have in her hair or what dyes did she use because I think it's so pretty and I would like to try high-lights in the future. 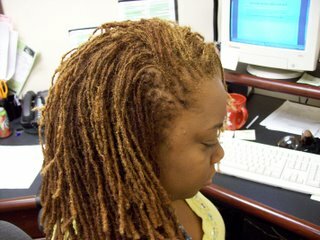 Girl you locs are slammin!! I hope to be where you are in a couple of years.